I visit quite often your excellent blog and so I have read this post. I agree that the living conditions of the Syrian refugees in Athens are quite below standard (I am a volunteer at the Metropolitan Social Clinic in Hellinikon and we also treat Syrian refugees). However, it is not that Greece wants to keep them here. Greece can not allow them to leave for another EU country because the Schengen Treaty and the Dublin II Agreement does not allow that. Sadly, if Greece (and any other Member State) breaks these rules, it will face a prosecution by the European Court. Also by being in the sixth consecutive year of economic depression, the Greek state simply can not provide for these people. So perhaps it would be better to turn the arrow in the direction of the EU policies. I agree with you that this is a European, not a Greek, problem, and I have written about that before in the Irish Times (see that article here). I think it’s absolutely disgraceful that the UK and Ireland have taken in about 90 Syrian refugees each, for example. Dublin II is a disaster for Greece, which should loudest in calling for a common asylum policy. However, it’s not just Schengen and Dublin II that is preventing Greece from allowing refugees leave. There is also a financial motive. From 2011-2013, the European Commission allocated almost €227,576,503 to Greece to police its borders and only €19,950,000 in funds to help refugees. That’s a quarter of a billion in total, which is no small amount. I’m not sure where all that money goes, but if Greece were seen not to be doing the job it is being paid to do (keeping people out), then I would expect that the commission would have another look at the budget it is paying Athens for this work. I’m a huge admirer of what the Metropolitan Clinic at Elliniko does and have written about your work many times. Please keep up the excellent and crucial work your end, too. Να ευχαριστήσουμε τον κύριο Mac Con Uladh γιατί μας θύμησε μέρος της Ιστορίας μας. Μιας Ιστορίας άρρηκτα δεμένης με τους γείτονές μας είτε είναι κοντά είτε μακρυά μας. Damian, regarding the picture, the caption is almost certainly wrong. 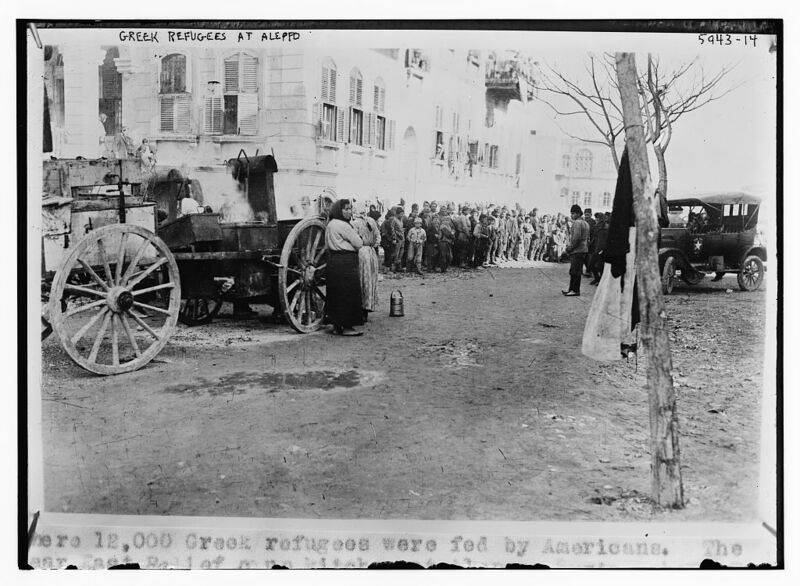 There have never been 12,000 Greeks in Syria or Greek Asian Minor refugees in Syria. From the way they are dressed ( especially the fezes in men, which would not have been worn by any greek at the time) I would probably think they are Turks been expelled from Syria or possibly turkish Cretans (greek speaking so maybe considered greeksby the photographer) after the large population exchange between Greece and Turkey. This comment doesn’t take away anything from the actual facts of your article. The 12,000 figure for Aleppo comes from the photo caption. My wife says she remembers a local shopkeeper of Asia Minor origins wearing a fez – in Greece – until the 1980s. Reblogged this on Τυμβωρύχος τῶν Αἰώνων. Thank you so much for that very nteresting post. Greeks tend to have a very selective memory as far as history is concerned, and this is the cause of a lot of their sufferings. I feel the urge to say a big thank you to all the Syrians at Syntagma because they’ve reminded me that people are meant to be pitied, but to be admired for their courage and energy, they’ve shown me that you can maintain your dignity even if you sleep on a wet blanket in the center of an unknown city and finally i want to thank them for their kind smiles and friendship. I also feel the need to apologize on behalf of all those that may have been less than welcoming here in Greece and of any inappropriate comments you may have heard. I hope Syrian people have realized that they are not alone here and that for every person that looks down on them there is another who is a friend. A friend ready to fight for their rights (our rights as humans) and do the best he can to make their stay in Greece as safe and easy as possible under the circumstances. Thanks for your comment. It’s clear that you have been to see the Syrians. The protesters at Syntagma are very fine people and, like you, I’m impressed by their courage and determination and at how they can continue to hope and dream of a better life despite all the ordeals they have been through. They have many friends in Greece and they know that.